Reward customers for making purchases by giving them points which can be spent on rewards, using the Incentivized purchase module. The number of points given for each purchase is a predefined percentage of the value of the individual products purchased. Let your customers know how many points they can earn by buying each item with the help of our incentivizing snippet integrated into your product pages. Loyalty points can be redeemed for discounts on subsequent purchases, reducing the total basket value of future purchases. As this is a core feature of the Loyalty Management Software, you can learn more about it in our Loyalty Platform Settings guide. Please ask your developer team to insert and customize the redemption interface in your webstore environment. You can find the configuration page for the Incentivized purchase module by clicking on the ‘Modules’ link in the top menu bar, then selecting the ‘Purchase driven modules’ from the list on the left-hand side. In the first section, you can set up the point logic that will be the basis of rewarding your customers for making purchases in your store. Warning!Points are calculated by items separately, not by the total basket value. Set the percentage of the purchased product’s value that you want to offer as a point reward. Eg. if you set the point percentage to 10%, a customer who purchases one product for €100 and another product for €10 will earn 11 points in total. Tick the ‘Reward points for the discounted price’ if you would like to calculate the number of rewarded points based on the discounted price instead of the full price. Please note, that you should send the discount information in the chekout_item event so that we can calculate with the discounted price. Round: All decimal point values will be rounded according to general mathematical rounding rules (eg. : 38,7 points will round up to 39 points; 38,3 points will round down to 38 points). Ceil: All decimal point values will be rounded up (eg. : both 38,3 and 38,7 points will round up to 39 points). Floor: All decimal point values will be rounded down. (eg. : both 38,3 and 38,7 points will be rounded to 38 points). The value of your loyalty points can be set in the ‘Settings’ menu. 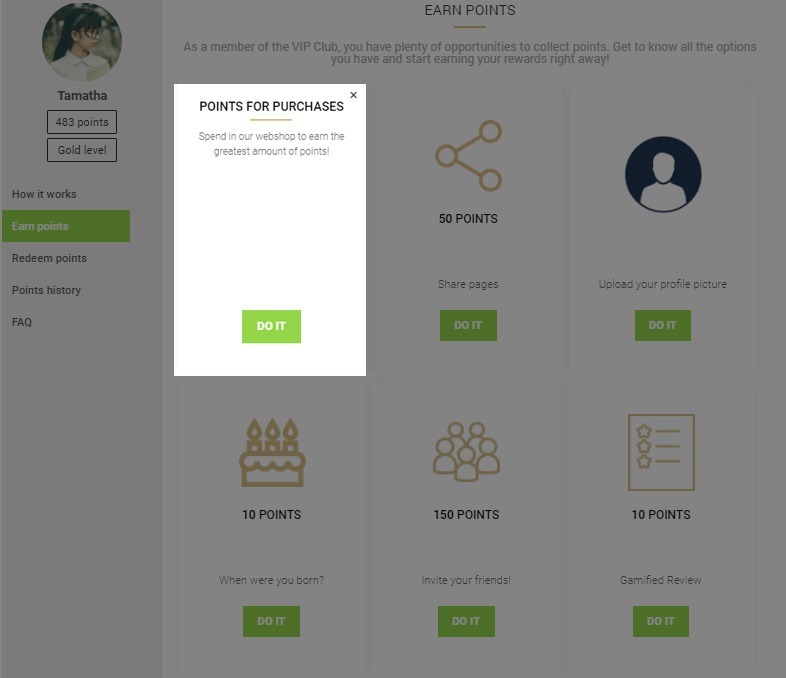 When the Incentivized purchase module is enabled, customers can find out that they can get points for their purchases in the Loyalty Hub. This notification appears as a card, alongside other cards that show customers other ways they can earn points in the loyalty program. 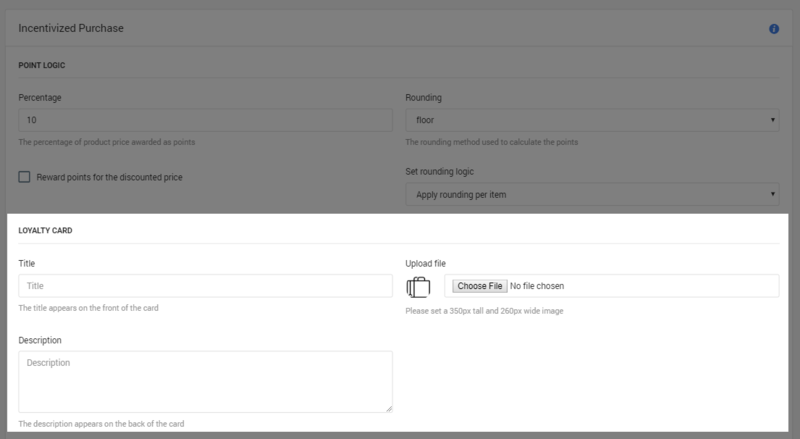 In the second section of the module configuration page, you can define the content of the card. Each card appearing in the Loyalty Hub has a front and a back side. On the front you can see the custom image that you’ve just set, and the number of points you can get for a purchase (this text cannot be customized on the Platform) Moreover, a CTA button appears that flips the card over to display the back side. On the back of the card, customers can find the title and the description added in the configuration interface. In addition, the CTA button leads to the page you have set in the ‘Website’ field of the General Settings section of the Settings page. 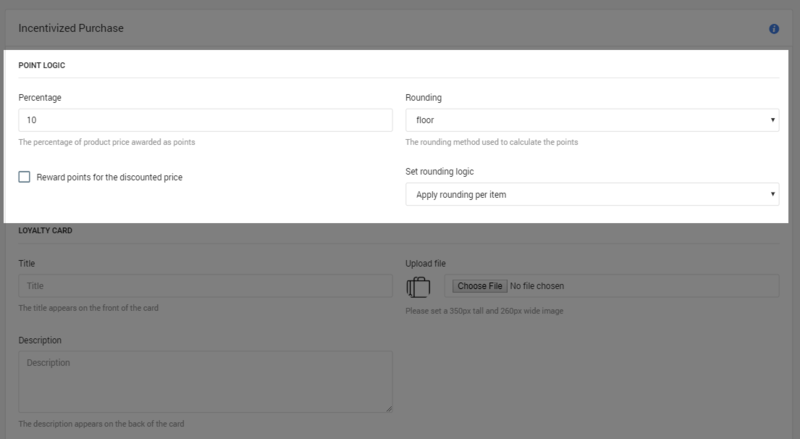 Don’t forget to click the ‘Save’ button after you have finished configuring or modifying the module settings. If you change your mind, use the ‘Cancel’ button to exit the setup page without saving your changes. The appearance of the cards in the Loyalty Hub can be further customized, please consult your Onboarding manager. 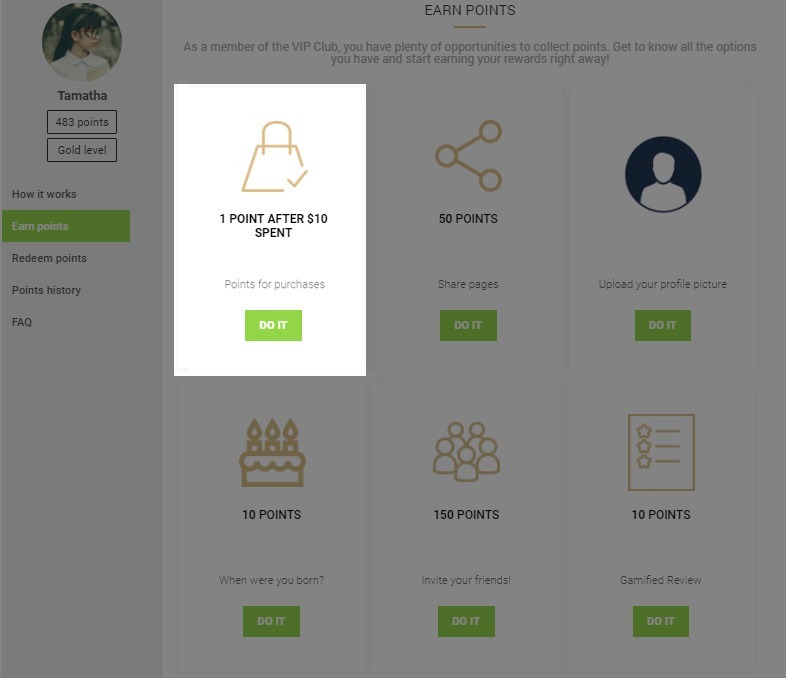 In addition to the Loyalty Hub, customers can learn about earning points when they visit product pages. 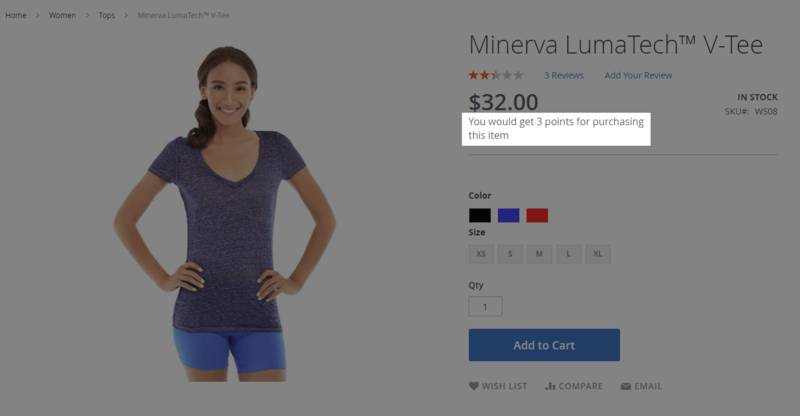 Incentivizing text on product pages displays the number of points the customer can receive when they purchase the item. Please note, that this is something that cannot be set up inside the Loyalty Management Platform. The incentivized snippet must be implemented into your product pages and customized by your developer in your website environment. If you decide to remove it, your developer should delete the associated code.